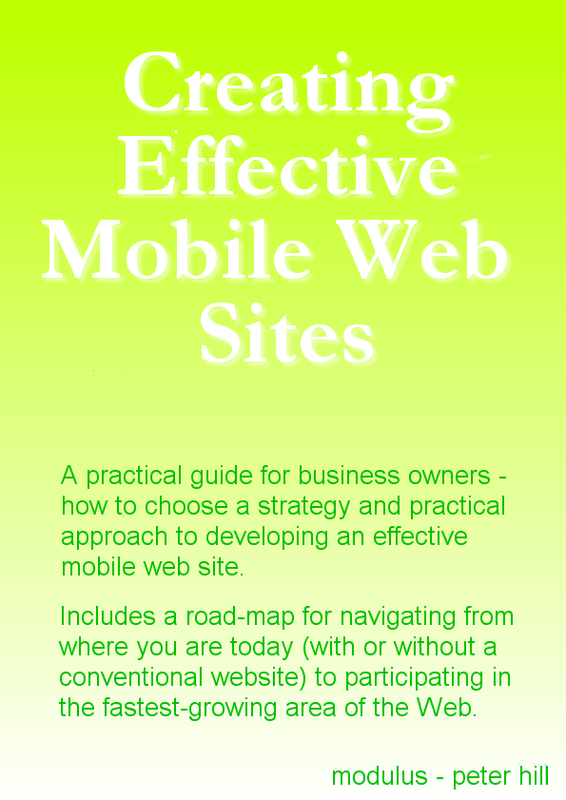 In this book we will show you that, whether you are seeking to create a new mobile-web-friendly website or adjust your conventional website to provide mobile support, there is a structured approach to creating an effective mobile web presence, despite the standards and approaches evolving quickly. Our mobile web development road-map will help to structure your approach and ensure that key tasks and decisions points are approached correctly. The rest of this book is structured according to this road-map. The first step along the road-map is to develop an understanding of the mobile web's characteristics and character. The mobile web is currently significantly different from the desktop web; furthermore, the approach that mobile web users have to mobile web usage is substantially different from the approach that they might have when surfing the web from a desktop machine; these issues are discussed in the section "Understanding the Characteristics of the Mobile Web". With that understanding established, we next choose an overall strategy, in the section "Choosing a Mobile Web Strategy". We will discuss the best strategy options for establishing an effective mobile web presence available and their implications. An approach to development of the mobile web presence must be selected; in particular an important decision must be taken as to whether the mobile web site will be essentially static or adapt to the devices which send it requests. The considerations for this choice are discussed in "Selecting the Development Approach". Whether you are developing a mobile web presence from scratch or re-purposing existing content (of a desktop website) for the mobile web, appropriate content will have to be developed for the mobile website. In the section "Developing Mobile Web Content", we discuss how to structure and author web content specifically for mobile websites. Once the development approach has been selected and the content developed, the marking up of that content can commence. The section "Marking Up Mobile Web Content" covers the task of creating a website from the provided content which meets appropriate standards and aligns with the selected development approach. "Validating the Mobile Web Mark-up" is an important step in the journey, which ensures that the website meets its design goals; appropriate tools and approaches for doing this are discussed. One critical component of the road-map which should not be overlooked is "Review of Mobile Web Status". We believe that the mobile web will develop rapidly and evolve in directions which we cannot yet foresee, both technically and in its business models; consequently it is of critical importance to review the state of development frequently. develop an exclusively mobile-based web presence. Each of these strategies is perfectly valid, it is simply a matter of which is appropriate for your business needs. The first strategic option ("deferment") means to make no move to a mobile web presence now, but rather to keep a watch on demand and developing technologies with a view to choosing a better entry time. This strategy has the obvious advantage that the business can await a better settled set of development standards, an overwhelming demand-based economic case, or both. The drawback is that by the time these incentives are strongly felt, competitors may have established a strong position in the mobile web market. Being an early adopter of new technologies can confer competitive advantage, but is rarely as painless as we might imagine. 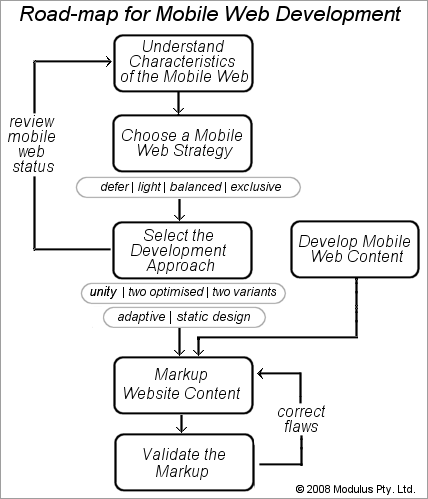 The second and third ("mobile-web-light" and "mobile-web-balanced") are simply points on a continuum. "Mobile-web-light" means creating a mobile web presence with minimal cost and effort, both in terms of the initial development and ongoing maintenance. This will mean that the mobile web presence will probably be static in nature, i.e. it will not seek to adapt to the device requesting content, but rather render content which is suitable for all mobile devices. Consequently, the web presence will not make use of advanced features on newer devices. Depending on the type of mobile web user, this may be of critical importance or of very little importance. Users of the (Google) type "Repetitive now" or "Urgent now" will normally not be discomforted by a sparse design with limited bells and whistles, provided that their access to the information and data they desire is not impeded by that sparseness. Users of the (Google) type "Bored now" are unlikely to be entertained or satisfied by such a website. Thus, whether this strategy is appropriate to your business needs depends on the type of content of your website and, by extension, the type of user you are seeking to attract. "Mobile-web-balanced" means creating a mobile web presence which is equal in quality and utility to your existing desktop web presence and which is kept as current as any other part of your marketing presence. This strategy is likely to require you to develop content specifically for the mobile web component � not to differentiate the mobile from the desktop, but, paradoxically, to ensure that the mobile web presence delivers as full an experience as the desktop web presence. The last strategy option ("mobile-web-exclusive") implies building a mobile web presence which is not linked to a desktop web presence or which provides markedly different information and functionality to a desktop web presence, such that it is a different entity. This strategic option has advantages, particularly for certain market segments such as travel, entertainment and event management, which may benefit from a concentration on leading edge marketing. When choosing this strategic option, two key aspects of differentiation must be borne in mind. Firstly, the mobile web presence is likely to be most successful where there the "mobile" part of the equation is important. Thus the sort of mobile web content which is especially useful when commuting, travelling, waiting or away from the office is likely to suit this strategy. Secondly, the importance of the user's location must be recognised. If the website can take advantage of location information to provide further added value, it is likely to suit this strategy. updates the list as the user moves every minute. As can be seen from the example, much of the functionality of the example mobile website only works in the context of mobility and location recognition and consequently this example would be well suited to this strategy option. Modulus provides tools, applications and services to consultancies and website developers. For more information contact Peter Hill, peter.hill@modulus.com.au.